(3) Make suitable assumptions whenever necessary and justify them. (4) Each question carries equal marks. 1) Attempt any four from the following. a) Define AI. What are applications of AI? b) Define heuristic function. 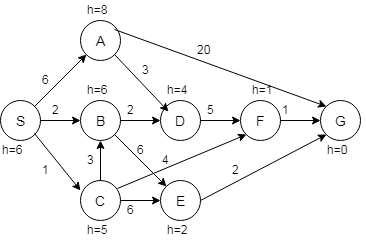 Give an example heuristics function for 8-puzzle problem. Find the heuristics value for a particular state of the Blocks World Problem. c) Compare Model based Agent with Utility based Agent. d) What are the problems/ frustrations that occur in hill climbing technique? Illustrate with an example. e) What is supervised learning and unsupervised learning? Give example of each. 2(a) Consider the search problem with start state S and goal state G. The transition costs are next to the edges and the heuristic values are next to the states. What is the final cost using A* search. 2(b) Explain the architecture of Expert System. What are advantages and limitations of Expert System? 3(a) Explain with example various uninformed search techniques. 3(b) Illustrate Forward chaining and backward chaining in propositional logic with example. 4(b) Explain a partial order planner with an example. Whoever can read is literate. Dolphins are not literate. Some dolphins are intelligent. i) Represent the above sentences in first order predicate logic(FOPL).